A blank corridor in a South Australian provider’s memory support unit has been transformed into an attractive and interactive mural to help residents living with dementia. Using silhouetted trees as the mural base, residents in Bellevue Court, Southern Cross Care’s facility in Gawler, can seasonally decorate each tree with buds and blossoms, flowers and leaves in the green or Autumn shades. “Rather than it be just a flat mural that never changes, we wanted something to be interactive with the seasons, and the textures and colours,” explains Julie Lloyd, Lifestyle Co-ordinator Bellevue Court. 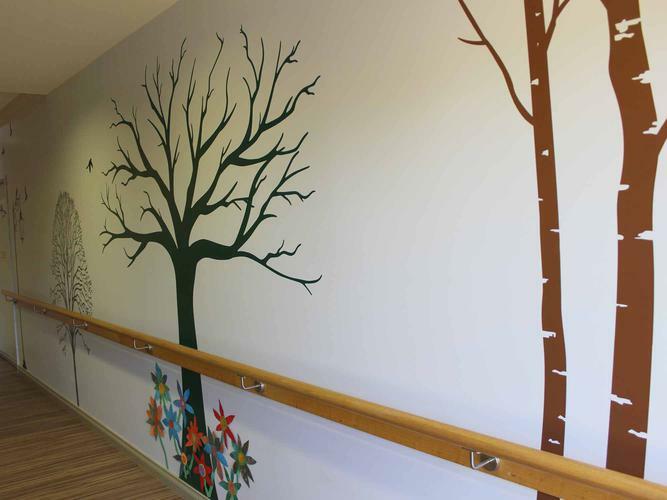 “The trees were chosen as the basic structure which could be added to and subtracted – murals are lovely, but static murals tend to get a bit tired after some time and often are difficult to repaint over, so we chose removable adhesive wall decals as the core structure. “Our residents have already made some flowers and blossoms from coloured and textured cardboard to start the spring scene; we will also be adding a few photo frames to one of the trees as a family tree type display of some group photos during activities,” she adds. The idea was discussed with several residents prior to starting, who were all keen to have the long wall brightened up. “As well as being a tactile experience, if pieces are pulled off and moved it doesn’t matter as nature changes daily and more can be added, the same or different, as required,” says Ms Lloyd. The mural also acts as an aid to help some residents find their way to the garden. “As people approach the mural and walk along the corridor looking at it, it gently guides them to the door leading into the garden, rather than coming to a stop at a blank door; it assists them to negotiate a corner,” she says, highlighting the benefits of garden therapy, indoor gardens and garden views are well documented as good for a person’s wellbeing. “We continually search for ways we can embrace this philosophy,” she concludes. Costing $400 to establish, the project was funded by Southern Cross Care’s Community Foundation Grants program.